Souhami, an accomplished storyteller, recounts what happened when Cuchulainn went in search of Finn McCool, and not with the intention of doing Finn any good. But Finn has the advantage of a quick-witted wife, who, quick as a flash, dresses her husband as a baby and pops him in a pram to hide before Cuchulainn arrives. 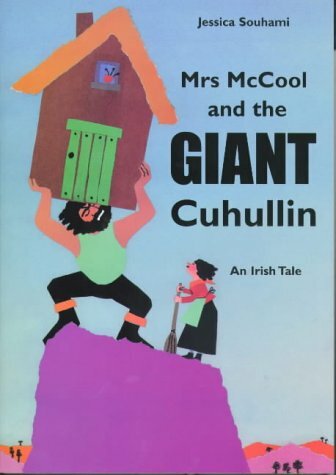 Awed by the strength of the 'baby' giant, Cuchulainn beats a retreat before the daddy, Finn, can get home, proving as Mrs McCool remarks, 'Big is big. But brains are better.' Souhami hits just the right tone with her dialogue and with the colour scheme for her collages, conveying a feel for the landscape supposedly inhabited by the two mighty giants. It is, in fact, a legend about two legends, as neither Finn nor Cuchulainn could have actually met, but if they had it couldn't have been a funnier encounter. This retelling is full of verve, and just demands to be read aloud, and the size and clarity of the illustrations make them easy to see in a group reading. This is a delightful, witty and highly attractive publication.